great mat , perfect in front of the sinks ! 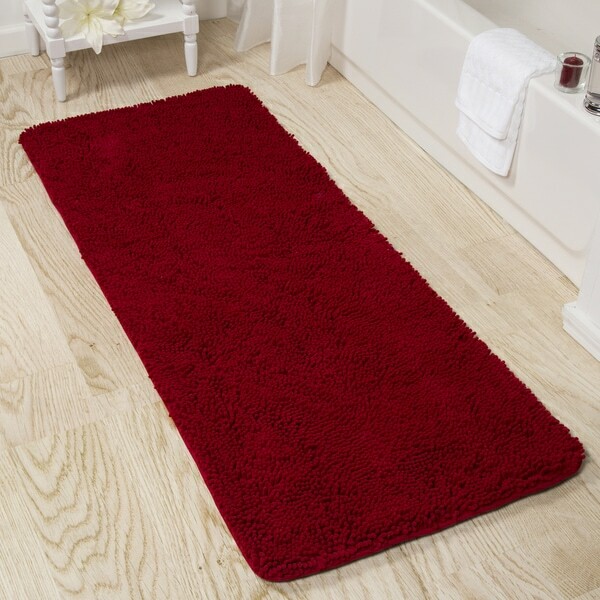 Step out of your tub and into luxury with the windsor home memory Foam Shag Bath Mat by Windsor home. Add a bold pop of style with high pile polyester chenille shag rugs. Featuring a soft and absorbent top layer of polyester chenille and a memory foam core bringing you maximum comfort while you dry off and get ready to start your day. I ordered for our remodeled bathroom. The size is perfect for our 6' double sink vanity. I ordered the chocolate color and it goes great with our espresso colored vanity. It does claims to be memory foam, but it seems to be more foam and less memory. However it is very comfy under the feet. The only other negative I have is that there the "shag" is not tightly spaced and you can see the material between, but the color is even so it's not noticeable unless to look closely. I would purchase again. 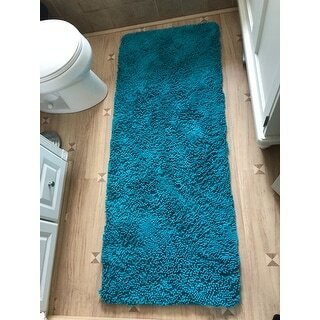 I did also purchase the 2 piece memory foam rug set from the same company in the same color to have a matching rug to put in front of the shower. They look great together. I gave this rug 5 stars because I love it! As a matter of fact, it was so nice I bought it twice! I got the aqua color, it’s very vibrant and the color is a deep sea/green, aqua/blue. Beautiful! Memory foam makes it very soft, and the shag is very thick chenille, very cozy on cold wood floors! Love this rug! Love that its soft and shagged, but also love that it's memory foam and super comfy to stand on. I got the grey and they look super pretty in my bathroom! I just love this mat, the memory foam makes it so comfortable to stand on and is absorbent. I ordered grey, however it almost looks purple. However I would purchase again if needed. Perfect size for my bathroom next to the bathtub. The mat is very plush and soft - love the memory foam! Color (grey) is as described, great quality bath mat. Bought this rug along with the matching 2 piece Memory Foam Shag Bath Mats- They are very nice quality and the color is very nice - we ordered the gray. I love this rug. I bought it in grey and the material and memory foam are great in the bathroom! This is a great rug. Memory foam to make them super comfy! I love the large shag style. I purchased purple rugs and they have a touch of berry in the purple which makes them beautiful and more vibrant than a deep amethyst. Great bathroom rug. So soft with the memory foam. I bought it in the color Gray. Very comfortable on the feet after getting out of the shower. Unfortunately this is a very, very red color not burgundy. Love it -- But so does the cat! This is soft and squishy for your feet, but my cat has already dislodged some of the strands. I would advise with caution for pet owners -- but 5 stars for non-pet owners. I purchased 2 of these to use as mats for the dogs to sleep on and they love them. They are an easy clean up to toss in the wash and dryer and they are good as new. Very happy with them. This should not be sold as white. It was extremely yellow looking...not almond but more of a yellow white which does not work when you are looking for white. Liked the size and the feel was okay but couldn't get the color to work anywhere. I bought two of these rugs in early September of 2016. Within six months of use the memory foam inside the rug started to ball up and now I have lumpy rugs. I have taken very good care of these rugs. I am a single guy that lives alone and spends most of my life working. I cannot imagine would happen if someone with kids bought these.The worst part is Overstock failing to stand behind the merchandise they sell. This rug has no protective back and slides too easily. I did not pay close attention to the full description.of this product. The color was not pleasing and I don't like shag anyway. So, I returned the rug. Very soft and slip resistant. It is high quality and holds up well in the washing machine. I need a navy blue one. Really big and comfy. I love the color that I ordered and it looks great in our bathroom. I haven’t had any problems with it thus far. Would recommend. Plush. Great quality! I look forward to getting out of the shower just so I can step on it. Awesome rug. Looks better than I expected. Good quality and looks great in bathroom. Great rug for my leather backseat in my car. I have 4 dogs and leather seats. "customer OstUser 27124157 bought the color I want can you look them up and tell me which color they bought? Thanks"
"Has anyone purchased the Grey colored rug. I want to know if the light gray is true to color. I just purchased a rug stating it was light gray but it had more of a blue hue to the gray which totally didnât match with my bathroom as I have white walls and white tile with a gray accent wall, also a gray shower curtain. I donât want to make the same mistake and have to continuously return items. Thank you"
I purchased the grey and, in my opinion, it is a true grey color. Fantastic rug all the way around! "someone said the white is off white, is this true? I don't want to buy and it not be a true white as picture shows"
I am sorry I didn't buy the white one. The color i did get was true to the photo if that helps. "Is the Windsor Home 24 x 60-inch Memory Foam Shag Bath Mat available in Sea Foam? I do not see it the the drop down." You can see the colors we currently have available listed under the options menu. At this time Sea Foam is not in stock. "I want red is it available? I read the reviews and they say the burgundy was more red and I don't see that color as a choice?" Hello Elcabnang, you'll choose Burgundy from the drop down options menu to purchase the red color. Thanks for shopping with us! "The burgundy rug looks more red in the picture. I want red...can you tell me if it is truly burgundy or red?" Hello lashleylynn, we try to represent the colors of our products accurately. Unfortunately, due to the difference in monitor colors we cannot guarantee that the color will match exactly what you see on your screen. The color is red. Thank you for shopping with Overstock! It's the only chenille rug I could find with non-slip backing. It is the right size for bathroom and liked the style.